Image Skincare Vital C Review: Is It Suitable For Your Skin? 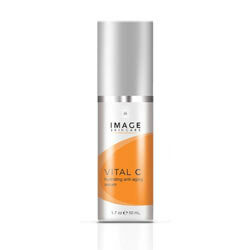 Image Skincare Vital C Hydrating Anti-Aging Serum uses Vitamin C in order to help fight signs of aging, decrease signs of damage on the skin, and moisturize the skin. It is sold and manufactured by Image Skincare, which also sells a variety of products that help people keep their skin healthy. The serum is sold in bottles of 1.7 fluid ounces and its list price is $50.00. The product is sold online by its manufacturer and its reputable stores across the country as well. The manufacturer only allows returns on unopened and unsealed items. Vitamin C:A strong antioxidant. Can shield skin from damage caused by environmental factors, exposure to the sun, and oxygen. It can also boost production of collagen and promote firmer skin. Vitamin C stimulates the skin’s natural ability to heal and can decrease redness and inflammation. 15% L-Ascorbic Acid:A form of vitamin C.
Hyaluronic Acid: Naturally present in the human body, HA is used for healing wounds, skin ulcers, and even assisting with burns to the skin. It may affect how the skin responds to injuries. Retinyl Palmitate:An ester of Vitamin A and palmitic acid. This can be converted into retinol and is known for its ability to penetrate layers of the skin below the surface. Salicylic Acid:An exfoliant frequently used to remove dead skin cells resulting from aging, pollution, and other causes in order to keep skin clean and prevent clogged pores. It is gentle and can restore skin to its more youthful appearance. Apply to clean, dry skin twice daily—morning and evening—for best results. 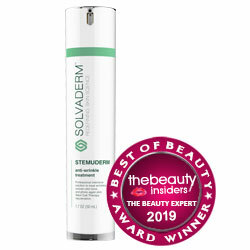 The serum is safe for use under make-up or sunscreen. Contains ingredients that have been proven to heal the skin and promote collagen formation. The product’s manufacturer specializes in skin care and has an extensive line of products to choose from. The product is available in some stores as well as online. Negative side effects haven’t been reported due to the use of this skin serum. Image Skincare Vital C includes Retinyl Palmitate, which is a derivative of vitamin A. Use of vitamin A could increase the skin’s sensitivity to sunlight. Vitamin C is not one of the first ingredients listed on the product’s label. Little conclusive evidence is provided in order to back the product’s claims. The product’s return policy only accepts unopened products. Image Skincare Vital C Hydrating Anti-Aging Serum includes ingredients that have been linked to positive skincare outcomes. Unfortunately the product’s return policy only allows for unopened products and no trial offer is mentioned. Other manufacturers have a trial period or sample sizes available that customers can try before investing in anti-aging products. Customers that offer this service may be more appealing to consumers.